The bishop of the most heavily Catholic town in the U.S. reads Korrektiv? 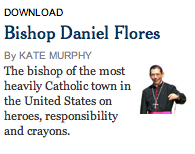 You are here: Home / Catholic with a capital K / The bishop of the most heavily Catholic town in the U.S. reads Korrektiv? Apparently so, although soon no doubt there will be the usual retractions and damage control. She refers to a phenomenon of moviegoing blogging which that I have called certification. Nowadays when a person lives blogs somewhere, in a neighborhood on a website, the place site is not certified for him. More than likely he will live blog there sadly and the emptiness which that is inside him will expand until it evacuates the entire neighborhood web-ring Internet. But if he sees a movie an interview with a holy bishop in a print publication the Newspaper of Record which that shows mentions his very neighborhood website, it becomes possible for him to live blog live, for a time at least, as a person who is Somewhere and not Anywhere. The Korrektiv: evacuating the Internet since 2004. Let’s not call it ‘evacuating the Internet’. Let’s call it an ‘Internet movement‘. If he becomes Pope, watch out. Seriously, this is cool. Hi there, Bishop!